Cook was born in a small village near Middlesbrough, (Marton) and learnt his trade in small sailing ships known as 'cats', in which he journeyed up and down the coast from the Tyne to the Thames. 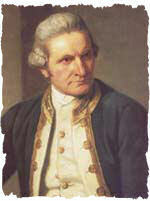 He later served with the Royal Navy, and in 1768 won the appointment of commander of the Endeavour. In 1769 Venus was due to pass in front of the Sun, a rare event that can be used to measure the distance of the Sun from the Earth. The Royal Society decided to send astronomers to the Pacific to record the transit of the planet, and enlisted the Navy's help. The Navy agreed, as long as one of their officers was in charge of the boat. Cook was chosen as commander, and the Whitby-built HM Endeavour was acquired and fitted out. After calling in on Tahiti to witness the transit of Venus, Cook sailed down to 40o latitude but found there was no land. In accordance with his instruction he turned and headed towards New Zealand, which had previously been 'discovered' by the Dutchman Abel Tasman. During the rest of the voyage Cook and his crew charted New Zealand, sailed the east coast of Australia and rediscovered the Torres Strait. 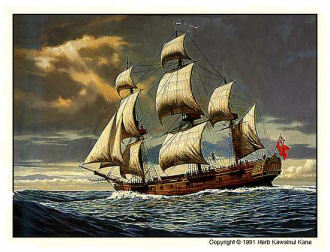 In 1772-5, not satisfied by his previous exploits, he made a second voyage of discovery, this time to chart the Atlantic. Misjudging the situation, he took their king hostage, after some hostility. Then during a brawl in another part of the island, one of the Hawaiian chiefs, Chief Kalimu, was killed by one of Cook's party. News of this reached the king just as Captain Cook was leading his hostage down to the Resolution. The Hawaiians had by now started to distrust Cook's intentions, and attacked the English group. Cook remained aloof from the fighting, until one warrior crept up behind him and hit him on the head with a large club. Other warriors then joined in attacking him with daggers, causing him to fall in the water. Cook managed to get his head up again, but another warrior gave him a shattering blow - and Cook went down for the last time.